Installation displays are interactive or passive and are presentations, classes, and/or parklets that celebrate the diversity, history, and heritage of the community, city, or region. They allow diverse groups of people to participate and connect with one another. They encourage creative conversations around public space and urban planning, and/or contribute to an ongoing dialogue about safer spaces on our streets. Must not exceed the 8 by 24 feet stall. We can try to accommodate the use of two or three parking stalls. Do not go over the 8 foot width to allow cars to safely pass. Should be temporary and simple to set up and take down. Should be sturdy and safe for people to walk through and around, and not interfere with traffic (nothing extending beyond the stall, nothing that can easily blow away). 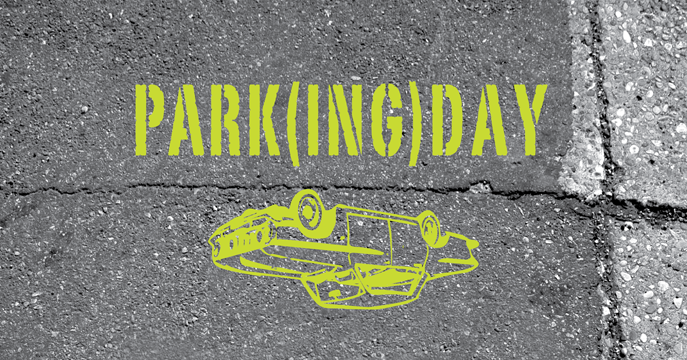 PARK(ing) Day is an international event where people transform parking stalls into temporary parks, interactive displays or art installations. The first PARK(ing) Day was initiated by Rebar, an art and design studio, in San Francisco in 2005. PARK(ing) Day was led by The Drawing Room, in collaboration with CITYlab and the City-Region Studies Centre, along 97 Street and 101A Avenue on September 18, 2015.